I got this new Modem and wondering if it supports IPv6 and if so how to get IPv6 to work? So far it shows it doesn't. RogersDave confirmed in the firmware thread that IPv6 is disabled in the CODA-4582 config file from Rogers at this time due to interoperability issues with the Rogers infrastructure. It will be enabled in January in 2.0.10.16 firmware. Lots of variables here, so let's start with the theory that auto-negotiation is not working on your particular modem, then test that theory. 1) Unplug everthing from the modem. 3a) For 1 of the machines, manually configure the adapter/controller properties & go to Speed & Duplex setting. Verify that it is set to Auto Negotiation. Confirm Yes/No. Set Speed & Duplex to 1.0 Gbps Full Duplex, then hit Ok. (If this is not available, choose another laptop for the test). 3b) Once set, plug the laptop into the modem and see if you get a yellow light. Confirm Yes/No. If you don't get a yellow light, do you get a green light or no light at all? 3c) Then test speed at http://speedcheck.rogers.com/en.html & report result - or verify that you cannot connect at all. 4a) Once done, unplug the laptop from the modem, and manually configure the adapter speed & duplex back to auto-negotiation (if you verified that this was the previous setting before changing anything). 4b) Then connect the laptop to the modem and see if you get yellow light. Confirm Yes/No. If you don't get a yellow light, do you get a green light? 4c) Then test speed at http://speedcheck.rogers.com/en.html & report result. 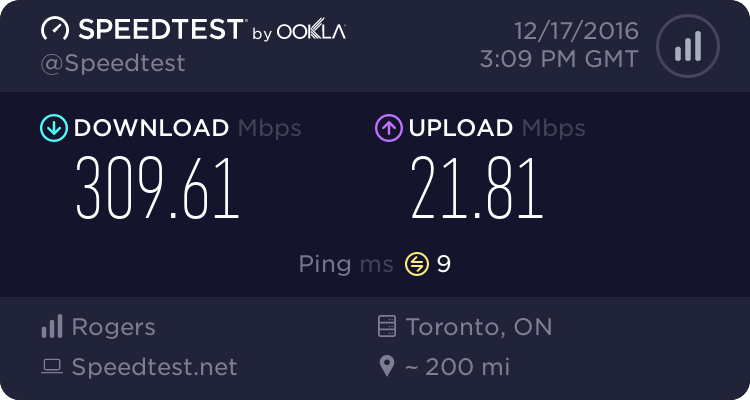 I wonder if all the reports of speeds topping off at 100Mbit are actually autonegotiation issues, and their speed isn't actually reduced at all? The top ethernet port on my modem tops out at 100Mbit. No amber light. The other 3 ports are fine. Green light on both attempts, 80-90mbps down but with a whole lot of jutter but the upload was solid 30mbps no dips. What kind of (network) cable are you using? The yellow one that came in the box. Says Cat.5e on the side of it. It's the same cable on the same laptops I used to test the gigabit connection on the black modem when I upgraded that one (from the prior modem that looked the same). My service went from 100u to gigabit. So Black Modem > Black Modem + > CODA. Sorry I can't remember the model names. Also the ethernet card on the main laptop I'm testing on is a JMicron PCI Express Gigabit Ethernet Card. @Abspatel I forgot to ask you to do this, but during testing, did you happen to look at the adapter status in your Windows/OSX to confirm that it was connected at 100Mbps? Is the result the same in both Gateway mode & Bridge mode? What firmware is the modem running? Spent over an hour with support for the same issue guys my port reverts to 100 from 1Gb, had my router in bridge mode if that helps. Support put router back in noraml mode and when the modem comes online after setup it changes your pc settings to 100 from 1GB. Support was clueless about the problem and wanted me to exchange the modem. I told support to escalate to engineer Team as this is not a hardware issue. Rogers inform your staff about these forums so they dont waste customer time on the phone and exchanging hardware when the issues is software.